The 42-year-old Olympian said there were several moments during the 5,220 nautical mile race from Sanya to Auckland when he and his team could have thrown in the towel. Instead, Walker kept his team’s hopes afloat using the same leadership style that enabled him to coach fellow Brit Shirley Robertson and her Yngling crew to Olympic gold at the 2004 Athens Games. "You have to re-adjust your goals and your focus and how you sail the boat,’’ he said. 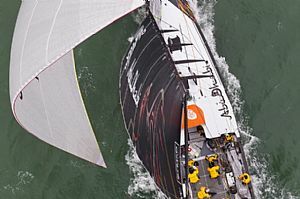 Walker admitted this principle was hard to apply during Leg 4 when his team slipped from third to fifth as Team Telefónica, Camper with Emirates Team New Zealand and Team Sanya cut the corner through the Solomon Islands. "It’s a bit harder if you’re leaking miles, that forces you to take risks at times, which is not something you want to do because you’re sailing against the best in the world and inevitably you come unstuck,’’ he said. "You don’t what to go spearing around taking risks because then you’re just gambling and that’s not what we’re about. Walker is hopeful of finding further opportunities in the five remaining legs and the promise of what has been illusive so far – downwind racing. "We’ve still not really gone downwind, let’s face it,’’ he said bluntly. "Telefónica looks like the gun boat, but everyone’s going to have their weaknesses at different times, so we’ve got to hope. "We’ve done six weeks sailing in this race so far and I think four and a half have been upwind. We have to get the spinnakers up and maybe it will be a different story. "You just have to keep believing, keep trying your best and good things will happen."